Consider it a jazz funeral of sorts — on the big screen — for Cosimo Matassa. “The Big Beat” — Joe Lauro’s documentary featuring the two most influential New Orleans musicians ever to commandeer Cosimo’s cosmically attuned recording studio — will be closing out the New Orleans Film Festival in back-to-back showings on Thursday, Oct. 23, at the historic Carver Theater. The starring musicians of “The Big Beat,” of course, are pianist Antoine “Fats” Domino and trumpeter Dave Bartholomew, who attained musical immortality with their multi-million-selling records produced at Matassa’s J&M studio on Rampart Street. 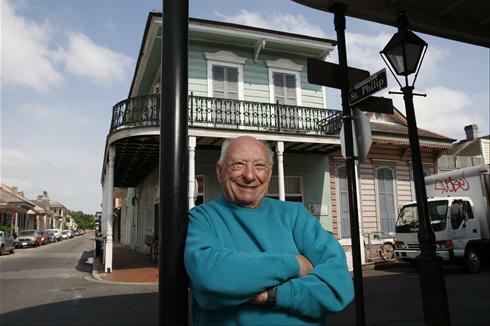 Matassa, who died Sept. 11 at 88, followed Domino and Bartholomew into the Rock and Roll Hall of Fame for helping shape the “New Orleans Sound” as recording engineer on their trailblazing 45s — as well as practically every other R&B, rock ‘n’ roll, jazz, and funk record made in the city from the 1940s to the early ‘70s. Renowned 78-rpm collector, filmmaker, historian, and musician Joe Lauro is no stranger to the Stomp: “The Big Beat” director has shared his amazing archives with us for years, and lucky attendees have seen endless eye-popping video moments from Lauro’s footage — a treasure trove of Stomp performers in their heyday. The centerpiece of “The Big Beat,” which was co-written and co-produced by Domino biographer Rick Coleman, is super-rare 1962 concert footage that Lauro previously unveiled at the Ponderosa Stomp’s Clandestine Celluloid Film Series in 2011. Apparently unearthed from a French archive, the sounds and images capture a turbocharged Domino, Bartholomew, and their crack band firing away on all cylinders at the height of their powers — with syrupy string sections and cloying backup choruses nowhere to be found. According to Lauro, it’s one of the “Holy Grail” relics documenting primordial rock ‘n’ roll. “The Big Beat” is scheduled for the Oct. 23 closing night of the New Orleans Film Festival, with showings at 7 p.m. and 10 p.m. at the Carver Theater, 2101 Orleans Ave. (just down the street from Dooky Chase’s famed Creole restaurant, the culinary temple to Platonic fried chicken and gumbo z’herbes, as well as a New Orleans musical landmark in its own right). Tickets, which go on sale Monday, Oct. 13, are $12 for Film Society members and $15 general admission. Lauro and Coleman will be on hand at the Carver, along with editor Anthea Carr, cinematographer David Leonard, and special guests. Click here for more information and to buy tickets, or visit the Contemporary Arts Center, 900 Camp St.
Now that we’ve highlighted the film about New Orleans’ “Fat Man,” let’s shift from red beans and rice to reindeer and red suits — to spotlight the festival’s other music movie about a fat man, none other than “old St. Nick,” Kris Kringle, aka Santa Claus. Jingle Bell Rocks Trailer HD from EyeSteelFilm on Vimeo. The documentary offers irreverent insights from Irwin Chusid, Wayne Coyne, Joseph (Rev Run) Simmons, bebop legend Bob Dorough, Clarence Carter, Doctor Demento, and many more. Equal parts social history, pop culture pilgrimage and revealing character study, “Jingle Bell Rocks!” confronts the Christmas music mainstream, re-inventing the seasonal soundtrack for the 21st century. Director Mitchell Kezin is scheduled to attend the screenings. Tickets are $9 for Film Society members and $11 general admission. To buy tickets, click here, or visit the Contemporary Arts Center at 900 Camp St. Both of these movies presented by The New Orleans Film Society are must-see viewing for Ponderosa Stomp fans, music lovers, and cinematic connoisseurs everywhere.